We raised a little bit of money for Hotrod Helps after the release of Listen Local Cooks Vol 2 last year. We thank all of you who purchased the book/cd compilation and hope you have enjoyed it. Now and then we'll share the download code at our events in the hopes that the amazing artists, poets, photographers and musicians who donated their work to the project will gain more exposure and many new fans. Thank you to Zank Bennett and Tara Alvarado for all of their help with this project! Get your FREE download code at The Belly Up on September 15th from team Listen Local as you enter the venue. There is a $10 cover that night to see Morgan Leigh Band, Playfight, Wicked Tongues and Daddy Issues. We'll be giving cookbook codes away until 9pm so get there early! This 75 page digital cookbook includes recipes, art, photos, poems and stories from friends of the San Diego music community along with 30 food-related songs. It was created and designed by Cathryn Beeks, illustrated by Tara Alvarado and sponsored by Zankme.com. The perfect gift! 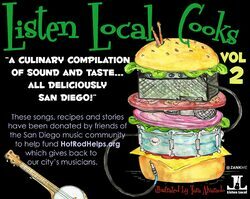 Listen Local Cooks is a culinary compilation of sound and taste, all deliciously San Diego! A portion of the proceeds will help our city's musicians in need." 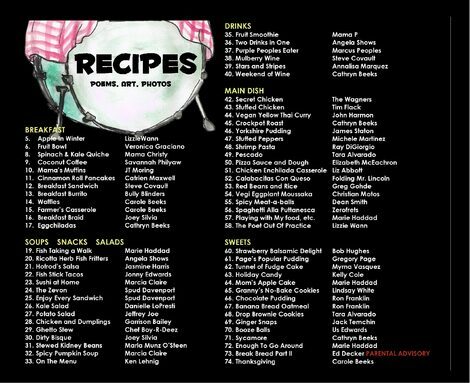 Listen Local Cooks Vol 1 was published in 2006 and features some of our favorite artists and their recipes. Back then, the hard copy sold for $20 and proceeds helped feed the homeless through The San Diego Rescue Mission’s programs. It's still a timeless treasure! Although the book is "out of circulation" we have plenty of CDs left and they can be purchased at any Listen Local show. It's only $5 and half of that goes to Hotrodhelps.org, which will help our San Diego musicians in need.